Every year I receive requests from journalists who want to know where the idea of Friday the 13th being unlucky originated. So here’s a summary of the lore which surrounds this widely held superstition. The idea that Friday 13th is unlucky or a day to be dreaded, both in terms of being generally inauspicious in terms of luck and in terms of breakdowns, accidents or even death, is widespread in folklore. But coincidence plays a major part in this perception, with the ‘bad luck’ attributed to Friday 13th arising from the prior assumption that the date carries evil in its wake. The British Library Newspaper Archive has published a handy round-up of stories on its blog that reveal the collective angst of the nation, from ships delaying their sailing time until one minute past midnight to deserted marriage and registry offices. There is even a word, triskaidekaphobia, to describe those who live in fear of the date. One example concerns the notorious Stocksbridge bypass (A616) road, near my home in Sheffield, Yorkshire. Since opening on Friday, 13 May 1988 there have been many dozens of serious accidents on the road, a number of which have been fatal. Accident investigators have attributed these to careless and dangerous driving. This has not ended speculation that the road has a jinx, for the area already had a tradition of hauntings before the bypass was built (see my paper on ‘Road Ghosts’). 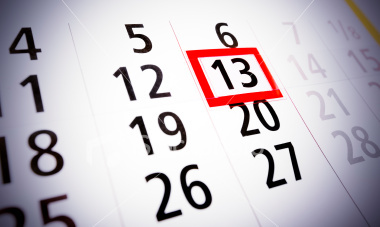 But the idea of Friday 13th being unlucky actually stems from quite a recent combination of two older superstitions: a fear of Friday that dates back to the Middle Ages, and a more recent dislike of the number 13. It is a surprising fact that the two ideas were not combined as one superstition in their own right until the beginning of the 20th century. Today it is claimed that the superstition is so widespread in hotels in the USA there is almost never a floor containing the number 13. On the other hand, in Italy 13 is considered lucky to the extent that a charm containing the number is given to infants to ensure good luck and prosperity. However, by the 17th century a belief arose that if thirteen people sat down to eat a meal together, one of them would die within the year. The source of this belief is that, during the Last Supper, Judas Iscariot was the first to leave the table and committed suicide shortly afterwards. Other more recent explanations offered are that 13 has evil or pagan connotations because of there being 13 witches in a coven, or that the ‘death card’ is the 13th Tarot trump. This entry was posted in Uncategorized and tagged baker's dozen, British Library, British Library newspaper archive, Chaucer, David Copperfield, Dickens, folklore, Friday the 13th, Stocksbridge bypass, superstitions, triskaidekaphobia. Bookmark the permalink. The problem with talking about Friday the 13th and not mentioning the modern myth about the Knights Templar is that some smart alec will come along and point it out (cue me). I’d love to know exactly when that particular myth originated, and who made it up (it certainly predates Dan Brown and the Da Vinci Code). Some modern-day Templar researcher in an English-speaking country must have noticed that the mass arrest of the Templars in France took place on a Friday the 13th, and thought “maybe the superstition started at that time, then died out in France and the rest of continental Europe, but persisited in the English-speaking countries for 700 years”. What makes the notion even more ridiculous is that the arrest of the Tempars was only unlucky for them… they weren’t exactly popular with anyone else. It would be like the English being supersititous about St Brice’s day… as if we were bothered one way or another that we massacred so many Vikings on that day. Whilst returning to my flat around 11pm one evening in June 1974 my boyfriend (now husband) & I were stunned to see two very tall silver figures. One was perched on the bonnet of a parked car & the other standing beside him. They both gave us eye contact as we passed them & entered the door to my flat close-by. They were not there when my boy friend passed by on his journey jome later that evening.